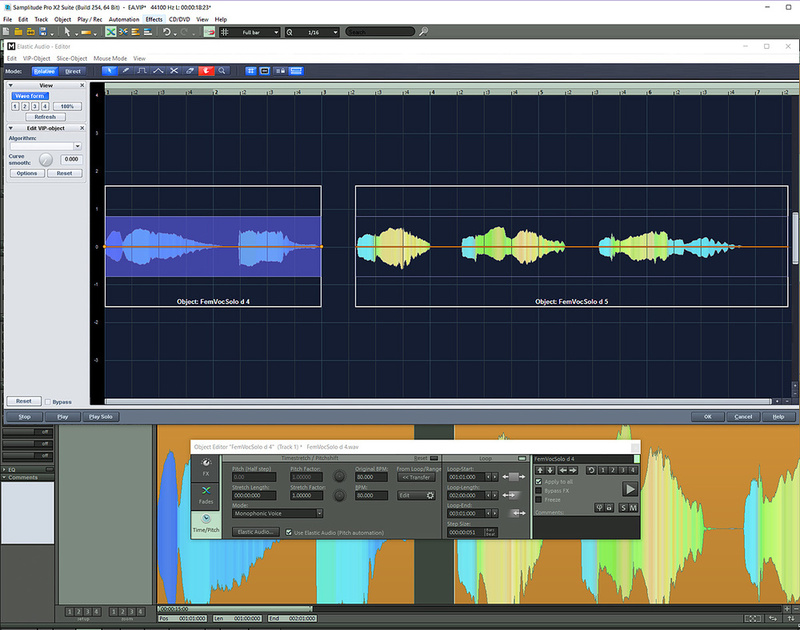 The Elastic Audio editor in Relative Mode, shown docked. Elastic Audio is Samplitude’s native real-time pitch-shifting editor, intended for use with monophonic mono or stereo audio. It was originally introduced in Samplitude 8, as long ago as 2005, and remains part of the latest Pro X2. Elastic Audio is object-based, so in order to use it you must first select an audio object in the VIP. Once you have selected the object you can open EA from the menu Object / Object Effects / Time/Pitch / Elastic Audio, or by setting a custom keyboard shortcut — I use Ctrl+Shift+E. You can also open Elastic Audio from the Object Editor (shortcut Ctrl+O) by selecting the Time/Pitch tab and then clicking the Elastic Audio button. The editor can be maximised to full screen if needed, or docked in Samplitude by clicking the docking icon at the far left of the Elastic Audio toolbar (although this isn’t ‘docking’ in the strictest senses, as it resizes the window to make it a more manageable size within the VIP). Elastic Audio has two editing modes: Relative and Direct. By default it opens up in Relative mode, although this setting can be changed from the View menu by ticking ‘Open in mode direct’ (which is my preference). Both modes use the same four algorithms, selected from the Algorithm drop-down list under the Edit VIP Object section on the left. The algorithms consist of Elastique Pro, Elastique Pro Efficient, Monophonic Voice and Resample; zPlane’s Elastique technology is a relatively recent addition, but I find that the sound of the original Monophonic Voice algorithm still stands up very well in comparison. Elastique Pro and Monophonic Voice both have the ability to use Formant Factor Correction, which can be turned on or off by opening the EA Options window. You can also switch algorithms from this window. It’s worth noting that if you have ‘Show extended tooltips’ enabled, when you open the drop-down list in this window, a very helpful pop-up will show the recommended uses for each algorithm. (To activate extended tooltips, press ‘Y’ and click on the General section on the left.) The Elastic Audio editor uses a timeline running left to right, like the main arrange page of Samplitude. Relative mode shows the audio waveform without any graphical pitch information. However, there is a vertical gauge at the left of the editor which gives you a numerical display. 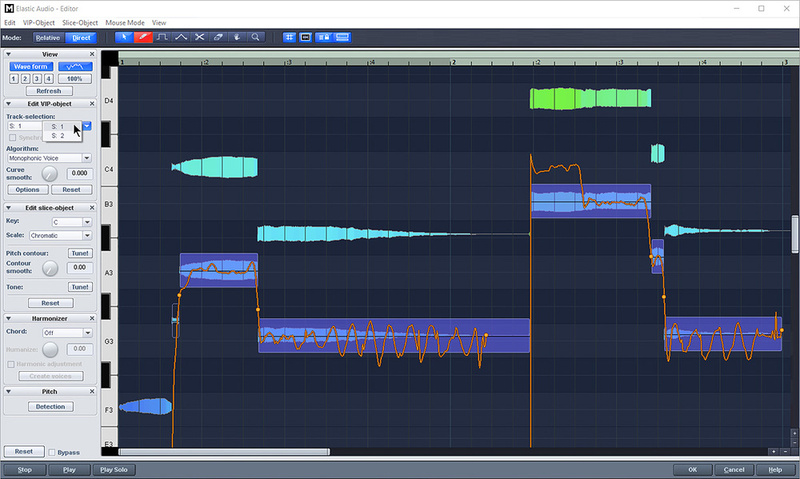 You can use the Alt modifier along with the mouse wheel to zoom this gauge between 0.01 cents and ±16 semitones. It’s possible to save/recall four zoom presets using the buttons in the view section of the editor. Multiple audio objects belonging to the same track can be opened in Elastic Audio. When the editor is initially opened, all objects are selected and highlighted in a light blue hue in comparison to the dark blue background colour of the editor. These objects will be displayed as separate waveforms within a white Object Border, with the object name at the bottom. You can toggle the Object Border on or off from the View menu, and use Ctrl-click and left-click to select and deselect objects respectively. Although Relative mode can be used for precise pitch editing, it can also be used for creating subtle to extreme pitch-shift effects thanks to the editing tools available from the toolbar at the top of the editor. The selection tool (arrow) can be used to change the overall pitch of the selected object by moving the orange pitch curve up or down. Double-clicking anywhere on the object will open a dialogue box where you can type the pitch value in cents. When a pitch line is active you will notice a node at the start and end of the object. These nodes can be grabbed and adjusted vertically. For example, grabbing the node at the right and pulling it up 3 semitones will give you a gradual pitch shift for the duration of the object from 0 to +3. Use the pen tool for freehand redrawing of the pitch curve. The Quantized Drawing tool will draw a stepped horizontal line which snaps to the grid in semitone increments and only affects the tuning. The Curve Bend tool will bend a single point up or down whilst retaining the relative pitch to the left and right. The scissors tool is used for slicing the audio, and the pitch of these individual slices can be changed by adjusting the pitch curve using the selection (arrow) tool. The eraser tool is for deleting edited pitch automation. You can also use the reset button to return all settings to when you first opened the editor. The hand grab tool will scroll the editor either horizontally or vertically. Lastly, the magnifying tool is for zooming in on a particular area of the waveform. You can also assign a second tool to the right mouse button from the Mouse Mode menu under ‘Right click button’. Click the Direct button to switch to Direct Mode. You’ll notice a few differences, including the piano-roll-style keyboard complete with note name, plus some extra adjustment options on the left. The Detection button, when pressed, will slice the audio and position the slices based on the pitches it detects. The orange pitch lines in this mode will display any variation in pitch or vibrato. Unlike in Relative Mode you can grab a slice with the arrow selection tool and move it up or down to change the pitch. You’ll notice when moving a slice that the a ghost curve remains, so you can reference the original position. In Direct Mode, the Elastic Audio editor gains a piano-roll-style keyboard down the left-hand side. Automatic pitch detection cuts the notes up and places them at the appropriate vertical positions. Under the ‘Edit slice object’ section you can set the key from the drop-down menu and also the scale from the menu below that. It defaults to C Major but you can choose from five different scale types. For example, if you choose F# Harmonic Minor, notes that don’t belong to this key will be greyed out on the keyboard. Pressing Pitch Contour: Tune! will re-tune the slices to F# Harmonic Minor — using this function and combining various keys and scales can yield some interesting results. A new Elastic Audio feature that was introduced in Samplitude Pro X2 is the ability to select multiple audio objects on different tracks in the arranger and switch between them from within the EA editor. This is particularly useful if you have several tracks of layered vocals be them unison or harmony. The active track will be outlined, complete with pitch information. You can switch between the different tracks from the ‘Track-selection’ menu in the ‘Edit VIP-object’ section. If you have Elastic Audio set to automatically open in Direct mode, when multiple tracks are selected, you will find that only the current active track will be automatically detected so you will need to change the track selection from the drop-down list and then manually click the detection button. Pressing the Tone:Tune! button will correct the pitch centres of the individual slices without affecting the vibrato. If you want a typical hard auto-tuned sound to the vocal, set the Pitch Contour knob to 0.00 and press the Pitch Contour:Tune! button. This will remove any vibrato variation, causing the orange pitch contour curves to straighten out completely. If you want the tuning to be less obvious, set the Contour smooth knob to a higher value. Of course you can always manually tweak these settings afterwards using the ‘Pen for free Drawing’ tool, Quantized Drawing tool or Curve Bend tool. Click the Reset button to return to the original unedited version. Elastic Audio can also be used to create harmony parts from monophonic audio. In order to use this feature, the Monophonic Voice algorithm needs to be selected. If the Harmonizer section is not showing, go to View / Harmonizer. Choosing a chord from the drop-down list will make the Harmonizer section active, whereupon the editor will display the added voices making up the chord as thin horizontal red lines. If you enable ‘Harmonic adjustment’, then adjust the Humanize knob and click the ‘Create voices’ button, the harmony voices will be affected. The higher the setting, the more unusual the harmonies will be, and the lower the setting, the more Cher-like they will sound! The root voices will remain untouched. To remove the harmonies choose Off from the chord list or press the Reset button. You can achieve some interesting results using the Harmonizer section, ranging from natural to synthetic and otherworldly, depending on how you treat the audio.